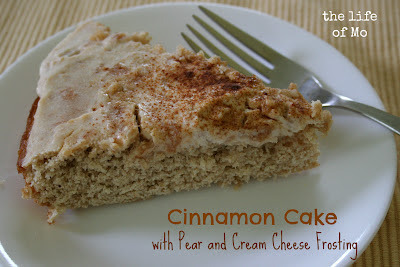 This cinnamon cake with cream cheese and pear frosting was Piper's birthday cake. It was very good. Almost like a coffee cake - it would have been a wonderful breakfast treat. Really easy too. I used angry chicken's Friday Cake recipe as our starting point. Cadence helped me make the batter. Actually, it felt like all I did was gather the proper ingredients and read the recipe. The frosting was an experiment and I'm so glad it turned out well! All you need is cream cheese and pear preserves. I just whirred up the cream cheese and pear preserves on high speed until the preserves were pretty well incorporated. If I had chopped up the pear pieces in advance it would have gone faster, but this was less work for me. When the cake was cool, I just spread on the batter, then sprinkled it with some cinnamon and a bit of brown sugar. I really liked that this cake was dense, and the cinnamon flavor was lovely. I also loved that the frosting was not too sweet. A good birthday cake for a one year old. Whiz the cream cheese and pear preserves in a stand mixer on high speed until pieces are broken up and texture looks good to you. I think we'll try this cake again (possibly for Cadence's upcoming b-day). For her, I'd sub cocoa powder for the whole wheat flour and strawberry jelly for the pear preserves. Here's Piper enjoying her slice. I think it's safe to say it was a hit, since she's shoving it into her mouth. Yummy sounding cake and the proof is in baby girl's face!